Deadman M.L., A.M. Al-Sadi, Y.M. Al-Maqbali, D.F. Farr, & M.C. Aime. 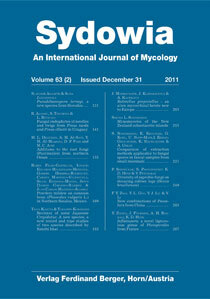 (2011) An annotated list of the rust fungi (Pucciniales) from northern Oman. The first compilation of the rust fungi occurring in the Sultanate of Oman is presented based on historical records and numerous recent collections, primarily from agricultural hosts. The study compiles data for 16 species of Pucciniales in northern Oman, along with voucher and sequence data and presents new distribution data for three of these. Species are also listed by host plant family.